Georgia in 2017 came achingly close to its first national championship since 1980, only to be thwarted on the final play of the season against Alabama in the College Football Playoff championship game. Still, the fact Kirby Smart was ahead of schedule in 2017 — coupled with an all-time great recruiting class making its way to Athens — should have Bulldogs fans raring for the 2018 season and beyond. 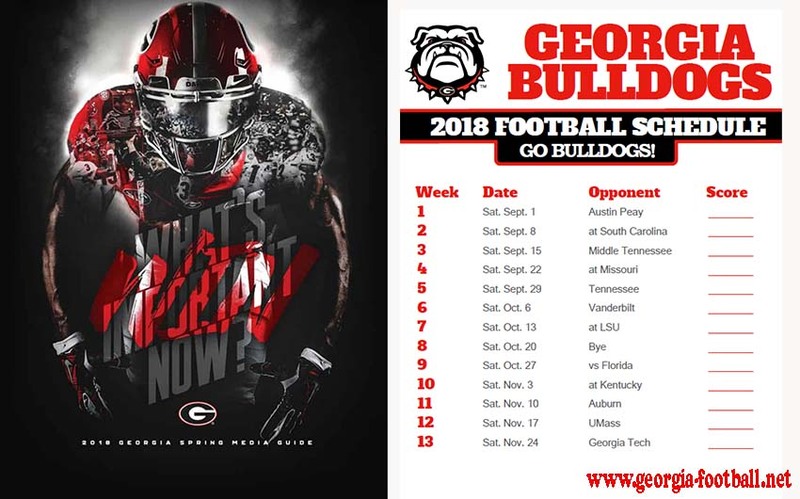 The Georgia Football rank No. 3 in Sporting News’ updated way-too-early top 25, and could very well end the season in that coveted No. 1 position. Georgia’s latest haul isn’t just the No. 1 class in the 2018 recruiting cycle — it ranks among the all-time great classes, with seven five-star recruits, all of whom are top-25 players. The class is headlined by quarterback Justin Fields (No. 2 overall, No. 1 DUAL), running back Zamir White (No. 9 overall, No. 1 RB), offensive guard Jamaree Salyer (No. 10 overall, No. 1 OG), cornerback Tyson Campbell (No. 12 overall, No. 2 CB), linebacker Adam Anderson (No. 18 overall, No. 1 OLB), offensive tackle Cade Mays (No. 22 overall, No. 3 OT) and defensive end Brenton Cox (No. 23 overall, No. 2 SDE). Nick Chubb and Sony Michel rushed for a combined 8,382 career yards at Georgia, making them the most productive FBS running back duo in history. Regardless of the talent stepping up to replace them, it will be a step back from 2017 — but not too big a step. D’Andre Swift worked in the rotation in 2017, averaging 7.6 yards a carry for 618 yards last, and could lead a more talented running back group in 2018. Elijah Holyfield and Brian Herrien rushed for a combined 558 yards and three touchdowns behind Swift, while White and fellow incoming freshman James Cook — the No. 3 all-purpose back in the 2018 cycle — lit it up in high school. As mentioned in South Carolina’s preview, the Sept. 8 matchup in Columbia will be the biggest game of the season in the SEC East. The Gamecocks are riding high off an impressive 9-4 campaign and have a considerably easier conference slate than does Georgia, who travels to No. 13 LSU and hosts No. 8 Auburn from the West. The margin of error is a lot smaller for Smart and Co. and, on paper, a loss to South Carolina would give the Gamecocks a sizable lead in the SEC East race. Conversely, a Georgia win relieves some pressure before the Bulldogs face off against LSU and Auburn. It’s not too early to wonder what Georgia’s 2018 class can accomplish this year, considering several players from Alabama’s loaded 2017 class contributed meaningful playing time in the Tide’s championship campaign — including in the title game. The Bulldogs’ 2018 class ranks third all-time behind Florida in 2010 and Alabama in 2017. Florida’s class never claimed a title, while Alabama’s took only one year to win it all; which way will Georgia trend? White and Cook can figure into the running back rotation. Fields provides an interesting dilemma at quarterback alongside true sophomore Jake Fromm. The loss of Isaiah Wynn and Dyshon Sims along the offensive line potentially opens the door for Mays and Salyer. And on defense, the departure of linebackers Roquan Smith and Lorenzo Carter provides an opportunity for Anderson. The freshmen should have plenty of opportunities to contribute in 2018.